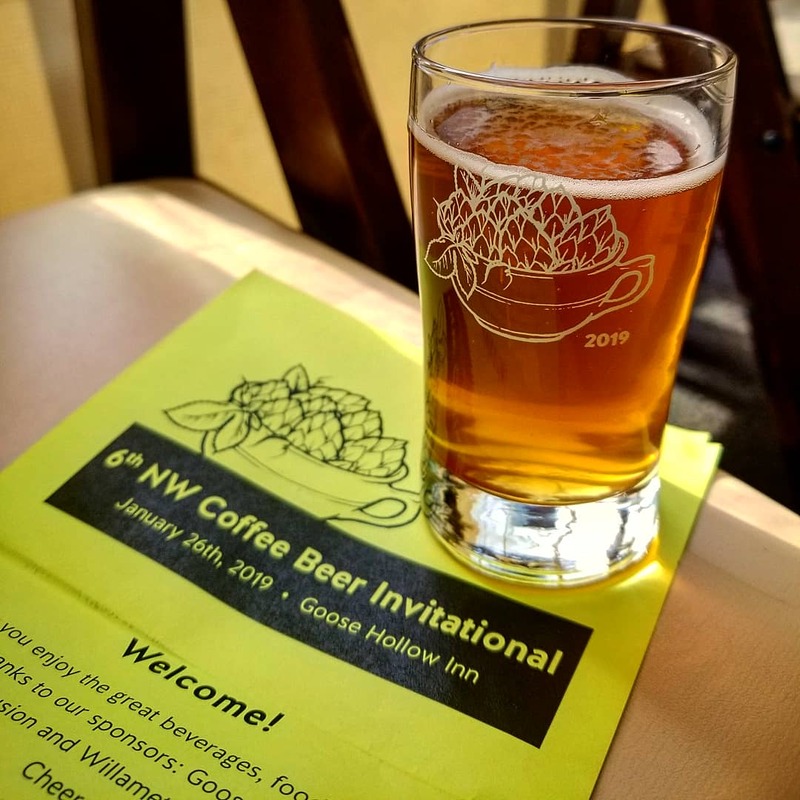 Last Saturday saw the sixth installment of the NW Coffee Beer Invitational beer festival take place at Goose Hollow Inn in SW Portland. 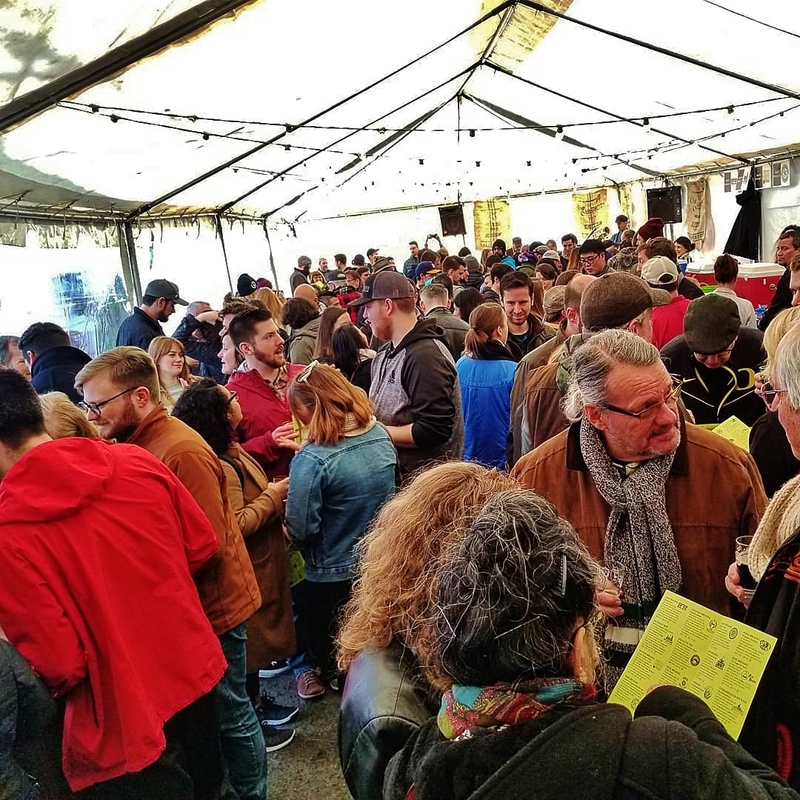 Once again festival organizers Dave and Jean Fleming were blessed with a dry January Saturday, although as thoughtful stewards they provided a fully tented and heated space for beer lovers to enjoy creations of 20 breweries. With the exception of Kiitos Brewing, all of the participating breweries hailed from Oregon and southern Washington. "What’s the deal with Kiitos then? ", one might ask. The answer is that they took home gold at GABF in 2018 in the Coffee Beer category with their Coffee Cream Ale. Had Bend Brewing not been at this festival with their Coffee N Cream Coffee Blonde, Kiitos would have gotten our nod for “best light coffee beer.” As it was, Bend Brewing offered a beer that had a great coffee cream aroma and a perfectly balanced, mild flavor and was more to our liking. Two of the beers at the festival spoke to this imbiber saying, "I'm meant to be drank with food." The first was Von Ebert’s Hegel Sipped Coffee in Bamberg, a Roggenbier (smoked beer) with beech and cherry wood smoked malts. The smokiness of the malts came through and although a bit more body might be nice, what would be really nice would be to have this with food...like Von Ebert’s delicious wings. The second food beer in our mind was from Fire on the Mountain Brewing. While we didn’t find much coffee character in the beer, the flavor spot-on matched its name: Mole Stout. The fact that they committed to the assertive flavor profile is to be commended and we think that although FotM is known for their wings, this might be mighty tasty with tacos. Or perhaps a taco pizza special at their Fremont location. The remaining three beers that we particularly enjoyed were all on the darker end of the spectrum. Sunriver Brewing His Dudness - Inspired by The Dude and his love of White Russians, this was the embodiment of a beer White Russian. Wild Ride Brew Co. Nutty Joe Jr. Porter - Hazelnut isn’t a flavor we often see in beer (or at least used well in beer) but we still have a soft spot in our heart for it that goes back to our early craft beer explorations and Rogue Hazelnut. That beer and this beer likely taste nothing alike but Joe Jr. reminds us of the feeling we got back then drinking Rogue’s beer. Ruse Brewing The Stages of Dawn - For having the highest ABV of the beers at the festival, 9.4%, it most certainly did not drink like it. The creamy imperial oatmeal breakfast stout came close to feeling as though it was being served on nitro, enough so that we would really hope to find it being poured that way in the future. 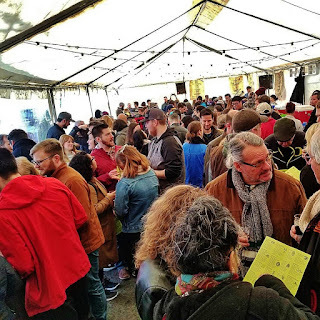 Thanks to all the breweries and coffee roasters that participated in this festival! It's one of our favorite and a great way to start a new year of beer festivals.